Summary: "Gwen’s life has been a rollercoaster since she discovered she was the Ruby, the final member of the secret time-traveling Circle of Twelve. In between searching through history for the other time-travelers and asking for a bit of their blood (gross! ), she’s been trying to figure out what all the mysteries and prophecies surrounding the Circle really mean. At least Gwen has plenty of help. Her best friend Lesley follows every lead diligently on the Internet. James the ghost teaches Gwen how to fit in at an eighteenth century party. And Xemerius, the gargoyle demon who has been following Gwen since he caught her kissing Gideon in a church, offers advice on everything. Oh, yes. And of course there is Gideon, the Diamond. One minute he’s very warm indeed; the next he’s freezing cold. Gwen’s not sure what’s going on there, but she’s pretty much destined to find out." 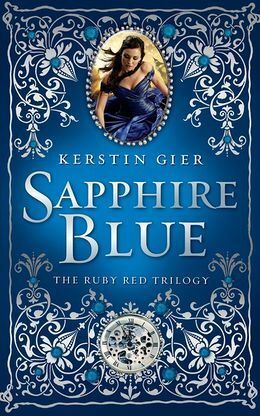 Review: Sapphire Blue is the second book in the Ruby Red Trilogy. It follows the same lighthearted tone that was set in Ruby Red, which I was immensely grateful for. There are time-travelling adventures, centuries-old secrets, villainous counts, insta-love romances, obnoxious and endearing gargoyles, and hilarious one-liners. This book is a carnival ride, and I had a fun time while it lasted. The mystery and action were always present, but Gwynneth sometimes has a hard time focusing on the tasks at hand while other serious matters also require severe concentration. Of course, those serious matters consist of over analyzing Gideon's every word. Gwynneth and Gideon are polar opposites of each other. She is as carefree as he is serious. She just assumes that things will work out, while he frets over every decade-appropriate nuance. (For example, she's been known to sneak her cell phone into one of her time-travel visits just so that she can show her best friend Lesley what eighteenth century fashion looks like. Gideon's more likely to dance a perfectly timed minuet than break rules so overtly.) They don't intuitively understand each other, and sometimes have a hard time communicating. But their attempts to reach the other person were funny and sweet and all around entertaining to read. The plot carried on much as it did in Ruby Red, which is to say that I was always entertained, but never quite satiated in my wonderment over what was really happening behind the scenes. I was always happy while reading, but, frankly, not a lot happened in this book. I wished that Gwynneth would find a way to sneak into one of the top-level meetings and find out what was really going on. I wished that Gideon and Gwynneth would stop their DTRs and focus more on the plot. I wished that batty old Aunt Maddie would remember some secret that would help them find more clarity in their mission. I wished I knew what their mission really was. More clarity would have been nice. But I laughed so much along the way that I forgave it its faults. I had a good time, but never found much of a purpose in this book. But you know what? In this book's case, that is perfectly okay. This book isn't trying to be more than the lighthearted story that it is. It just wants to give its reader a good time, and it succeeds in that goal. In conclusion, Sapphire Blue will put a smile on your face, but won't do much more. If you just need a cheerful pick-me-up, than this is the book for you. If you want something more substantive, I'd look elsewhere. I will keep this book on hand for next time I'm overwhelmed and stressed out and just need a break. In that situation, this book would be the perfect breather.